Statistical Skier : Is Sprinting A Young Person’s Game? Is Sprinting A Young Person’s Game? Conventional wisdom (and probably a fair bit of physiology research) holds that going fast over short distances is a skill we tend to lose as we age. Are fast World Cup sprinters younger than fast distance skiers? 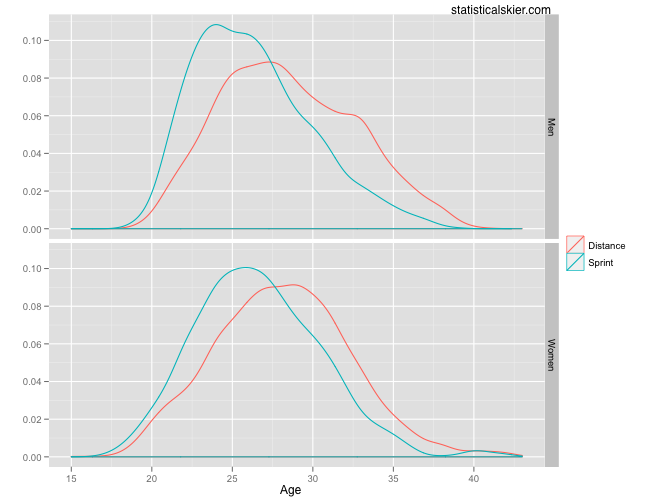 Certainly looks like top-30 distance skiers are slightly older and a simple t-test confirms a significant difference of about 2.1 years for the men and 1.5 years for the women (although the statistical significance is most likely largely a factor of the huge sample size here). Just eyeballing it, it appears that the difference is even larger. And again, the t-test’s confirm this suspicion. The differences bumps up slightly to 2.8 years for the men and 1.9 years for the women. Of course, this is just a difference in the average age for sprinting and distance racing. As the distributions above show, there’s still quite a bit of variation in ages for fast skiers in both disciplines. Posted by Joran on Friday, August 12, 2011, at 6:00 am. Filed under Analysis, Cross Country. Tagged Age, Distance, Sprint. Follow any responses to this post with its comments RSS feed. You can post a comment or trackback from your blog.